A Cogswell Street home is famous for being homely, but some neighbours aren’t thrilled with the new-found attention. Lis van Berkel gets the ugly truth. Robin Stewart thinks his house is ugly—and on its west wall, a billboard-sized sign has been declaring it so since September. Vandals didn’t tack it there. Neither did HRM’s Dangerous and Unsightly Bylaw- enforcement officer. No, this sign, emblazoned with corporate logos, was strung by the Nova Scotia Home Builders’ Association. 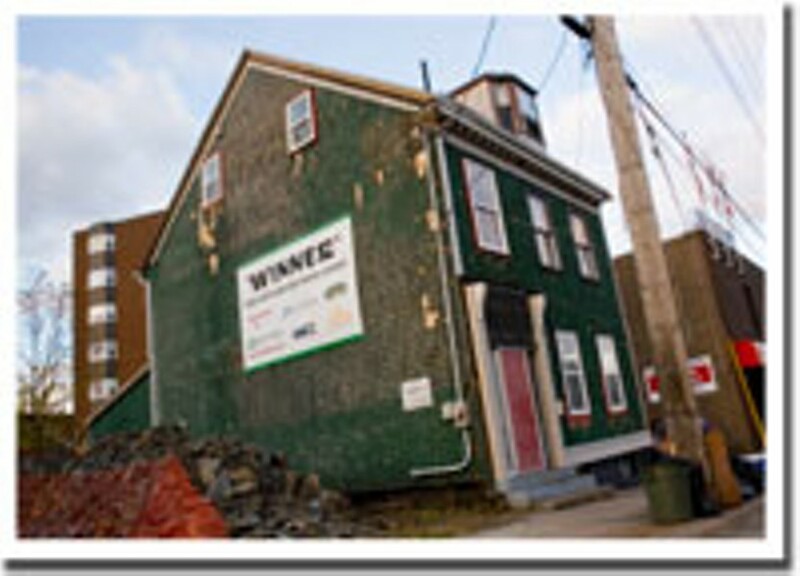 The NSHBA represents professional builders, renovators and developers in the residential construction industry. And the sign is part of a $15,000 prize package that the north end homeowner won when he entered the association’s Ugly Home Contest in March. The prize includes materials like blown-in insulation, roofing shingles and vinyl windows and doors, all of which Stewart is currently using to make his house more energy efficient—and, he says, more attractive. Near the corner of Cogswell and Creighton Street, Stewart’s house is one of a row which forms a graceful kind of promenade that has, since the 1970s, ushered thousands of cars per day into downtown Halifax over the nefarious Cogswell Interchange—itself the pinnacle of ugly, according to many north end residents. It is an ideal location for a marketing billboard—particularly since a 2003 fire destroyed the houses next to Stewart’s. But sustainability and beauty are like apples and oranges: wouldn’t a more appropriate title for an NSHBA promotion for insulating products actually be the Most Energy Inefficient Home? Not very catchy, and the competition would be fierce in a city full of nineteenth-century houses with walls insulated with newspaper, seaweed or rags—or nothing at all. An association dedicated to good building would do well to educate the public about that. Hal Forbes of Forbes Restoration and Design was taken aback when the sign first appeared on what he calls a “very stately” house. He has restored other houses on Cogswell Street and elsewhere in the north end using wood-frame windows, doors and shingles. Stewart, who also owns rental properties in the north end, says he’s “kind of saved the house” from developers who were likely eyeing the property. In addition to the empty lot—where the footing for one new house was poured earlier this month—the surrounding properties include the former legion building, which now houses a radio station.